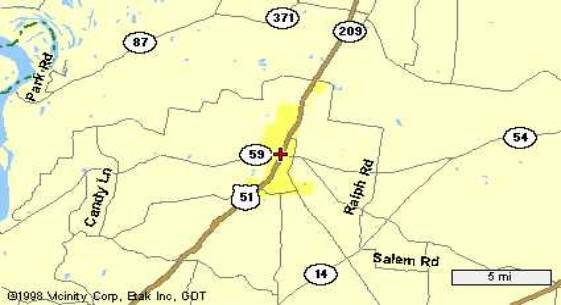 Covington is located at 35°33′54″N, 89°38′50″W (35.564937, -89.647168). 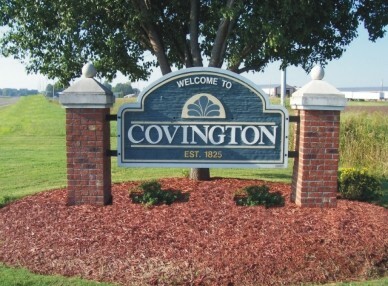 Covington is located in the Greater Memphis, Tennessee, metropolitan area, and it is located on U.S. Highway 51, a major north-south highway between Memphis and Illinois. According to the United States Census Bureau, the city has a total area of 10.3 square miles (26.7 km²), of which, 10.3 square miles (26.7 km²) of it is land and 0.10% is water. 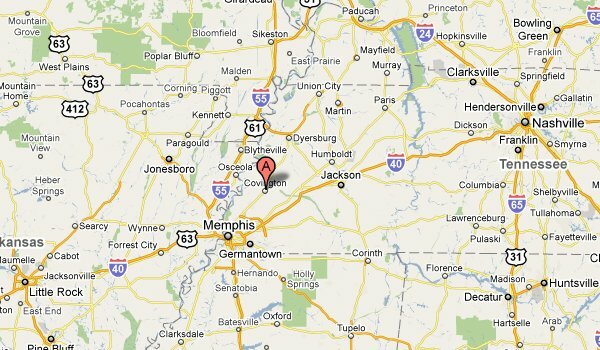 Covington is situated on the southeastern edge of the New Madrid Seismic Zone, an area with a high earthquake risk. As of the census of 2000, there were 8,463 people, 3,199 households, and 2,136 families residing in the city. The population density was 822.1 people per square mile (317.5/km²). There were 3,372 housing units at an average density of 327.6/sq mi (126.5/km²). The racial makeup of the city was 51.59% White, 46.54% African American, 0.48% Native American, 0.44% Asian, 0.05% Pacific Islander, 0.25% from other races, and 0.65% from two or more races. Hispanic or Latino of any race were 0.79% of the population. Cannon in front of the Nature Center & Veteran's Memorial in Covington. Marker in the background shows Nathan Bedford Forrest's last speech. (2007)There were 3,199 households out of which 34.1% had children under the age of 18 living with them, 37.9% were married couples living together, 25.4% had a female householder with no husband present, and 33.2% were non-families. 29.9% of all households were made up of individuals and 13.4% had someone living alone who was 65 years of age or older. The average household size was 2.54 and the average family size was 3.17. In the city the population was spread out with 29.7% under the age of 18, 10.3% from 18 to 24, 25.3% from 25 to 44, 19.3% from 45 to 64, and 15.5% who were 65 years of age or older. The median age was 33 years. For every 100 females there were 79.0 males. For every 100 females age 18 and over, there were 70.8 males. The median income for a household in the city was $24,684, and the median income for a family was $32,213. Males had a median income of $28,964 versus $20,938 for females. The per capita income for the city was $14,293. About 25.2% of families and 27.9% of the population were below the poverty line, including 37.9% of those under age 18 and 34.1% of those age 65 or over. A town and County seat of Tipton County, West Central Tennessee, 39 miles North East of Memphis, South West of Henning and Ripley, East of the Mississippi River and West of Jackson and Brownsville on U.S. Route 51 in a cotton-growing, timber area. The town had originally been incorporated in 1826 with the main trades being cotton yarn, cotton seed products and production of beverages. Fort Pillow State is a particular historic area, 35m N.W. via US 51N & TN 87W, near Fulton. It consists of 1646 acres on the Chickasaw Bluffs overlooking the Mississippi River. It is of historic & archaeological significance because of the remains of earthworks of the extensive fortifications built in 1861 by the Confederates and named for one of their Generals. Businesses in Covington which appear in Million Dollar Directory of the Top 50,000 U.S leading private & public companies in 1988 are The First State Bank, Tipton County Bank and Turners Dairies Inc.
Covington was established as Tipton’s seat of government on Dec. 11, 1824. 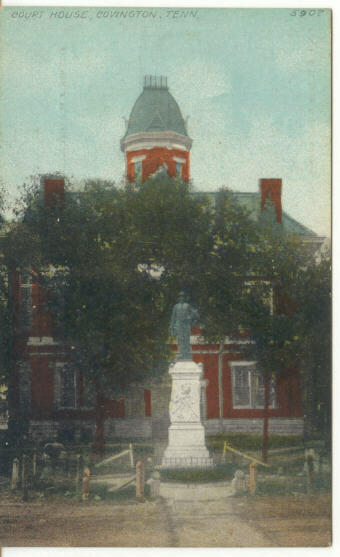 On Dec. 9, 1826, the state legislature authorized the incorporation of Covington. The town was named in honor of General Leonard Wales Covington, a native of Maryland who was mortally wounded in the Battle of Chrystler’s Field on Nov. 11, 1813. 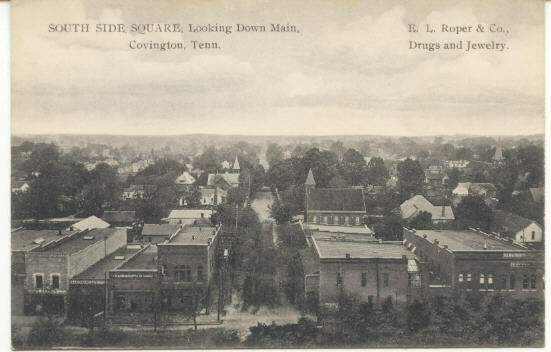 Throughout the county’s history, Covington has been the leading city for commerce, higher education and training, manufacturing, jobs and professional services. While in Covington drive down the Main and Maple Streets of the South Main Historic District and view the old homes and brick walks. The tree-shaded streets are especially delightful during autumn when the leaves show off their brilliantly bright colors. Take in an afternoon at the library or take your children to Cobb-Parr Park to enjoy the unique kids’ designed playground, swimming pool, ball fields, tennis and other amenities. As you travel our roads and highways you are retracing the trails and pathways of the ancient hunting grounds of the Chickasaw Indians. Recapture echoes of Randolph on the second Chickasaw Bluff, the first metropolis on the Mississippi River in Western Tennessee. Founded in 1823, Randolph was the king of steamboat river commerce and a cotton shipping point. The remains of Civil War field fortifications and a gunpowder magazine at Fort Wright remind us that several thousand Confederate volunteers from West Tennessee and Arkansas were encamped and readied themselves for battle during 1861-62. Telegraphic communication from Randolph to Memphis was established during the war and Union General William T. Sherman had his soldiers to burn Randolph in 1862. The Clopton Methodist Church campground provided an encampment for 500 Confederate volunteers. The Battle of Lemmon Woods took place near Covington, between a few thousand Rebel and Yankee cavalrymen, on March 9, 1863. Tipton County has a proud military tradition. Volunteers, militia, and organized companies have served in most of our nation’s wars. The “Covington Sentinels” was the county’s first militia company formed in 1830 with muskets, powder, and ball furnished by the State. County volunteers served in the Texas War of Independence, 1836, and the Mexican War, 1847-48. One thousand Tiptonians served in the Confederate army during the Civil War. Their legacy of battlefield valor and courage has continued through the World Wars, Korea, Vietnam, Operation Desert Storm and the liberation of Iraq. Covington was also the birthplace of legendary Soul singer Isaac Hayes on 20th August 1942.